What Is The Lower Adirondack Search and Rescue Unit? Lower Adirondack Search and Rescue (LASAR) is a wilderness search and rescue team located in the Adirondack Region of New York State. 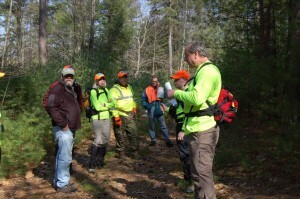 The team’s more than 60 volunteer members are dedicated to searching for lost people. We do this by using skills learned through extensive classroom education and field training. The Team is headquartered in Warrensburg, New York and meets the second Tuesday of each month at the local high school. All together, LASAR volunteers average 1,000 hours each year in searches for lost people and many more hundreds of hours are spent in training exercises. LASAR averages about 10 searches each year. The New York State Department of Environmental Conservation Forest Rangers is the responsible government agency for search and rescue in New York State. This means that any request for a wilderness search is made under the authority of the Forest Rangers. A search call-out is received by a LASAR officer who then activates the Team. Members respond from the southern Adirondacks and the Capital District including Albany, Essex, Hamilton, Saratoga, Schenectady, Warren and Washington counties. LASAR is a member of the New York State Federation of Search and Rescue. The Federation provides numerous training opportunities, information, expertise and projects of mutual interest to member teams. In addition to extensive training in search and rescue techniques, member teams work diligently to improve their K-9 unit search competencies and emergency medical capabilities. All members complete the Department of Environmental Conservation Basic Rescue Search Skills course. Many LASAR members also complete courses in land navigation, search management, CPR and First Aid. The LASAR team has built its skills and accumulated the necessary equipment to become a self-sufficient supporting field unit capable of providing search assistance to the Forest Rangers. LASAR has no regular source of funding. The Team is dependent upon contributions from individuals, groups, businesses and community organizations. The Team provides information on wilderness safety through lectures and demonstrations to various community groups. The LASAR Team prides itself on its reputation for wilderness search and rescue capability and safety. Team volunteer members donate their time, personal equipment and transportation. The ability to direct assistance to a lost person in trouble in a wilderness setting is a rare and fulfilling experience.